This giant Messmate Stringybark was the special guest at our picnic. 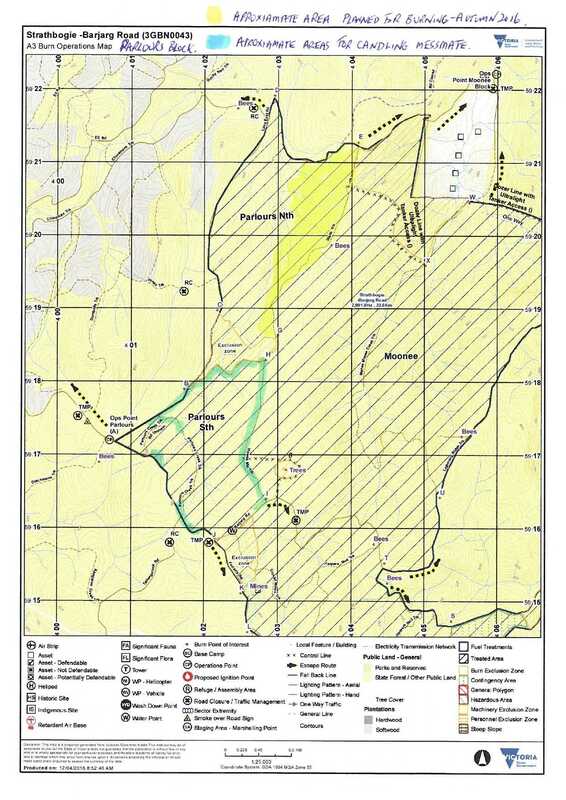 Parlours Block: yellow highlight- planned burn of drier forest; green line- candling of messmate trees around perimeter and internal access track. DELWP and Minister Neville have adopted a new plan for this season’s Barjarg Rd burn. Whilst this is very welcome news, the devil is always in the detail – and the forest is still soooo dry! 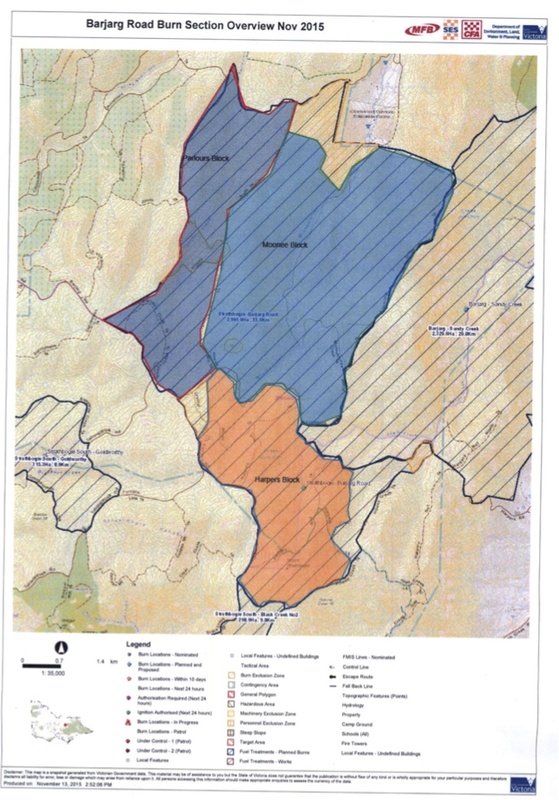 “Priority will be now be given to the Strathbogie South – Dry Creek burn [see footnote] and the Parlours Block component of the Strathbogie – Barjarg Rd burn. 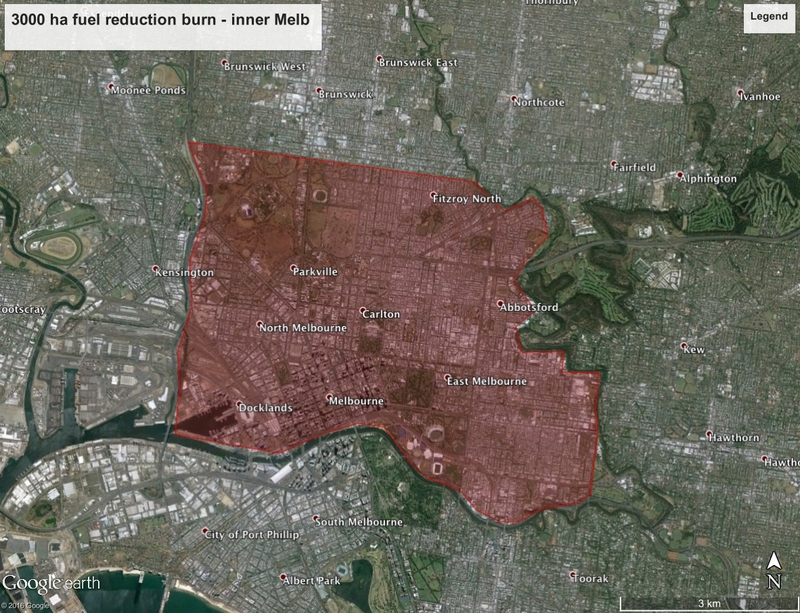 Both fall within the Bushfire Moderation Zone (BMZ) and have the greatest strategic value to risk reduction. 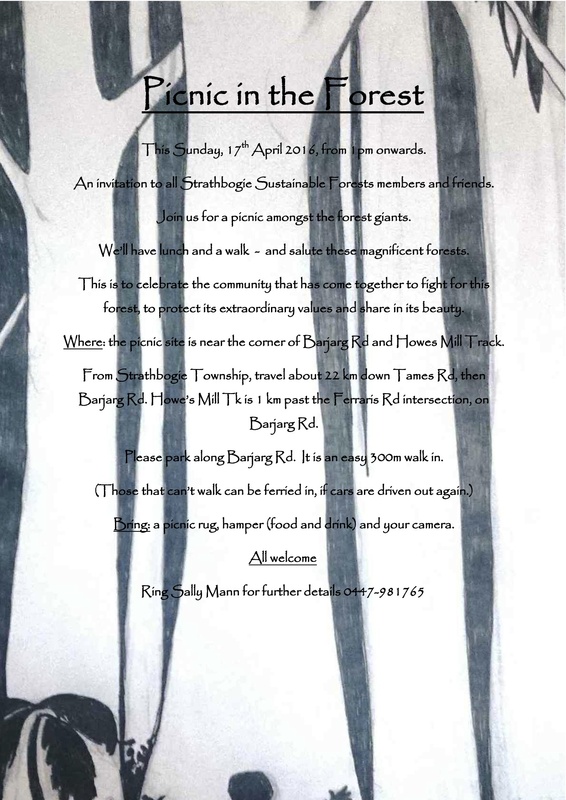 A newly formed local community group is urging DELWP to stop the 30 sq km Barjarg Rd planned burn. 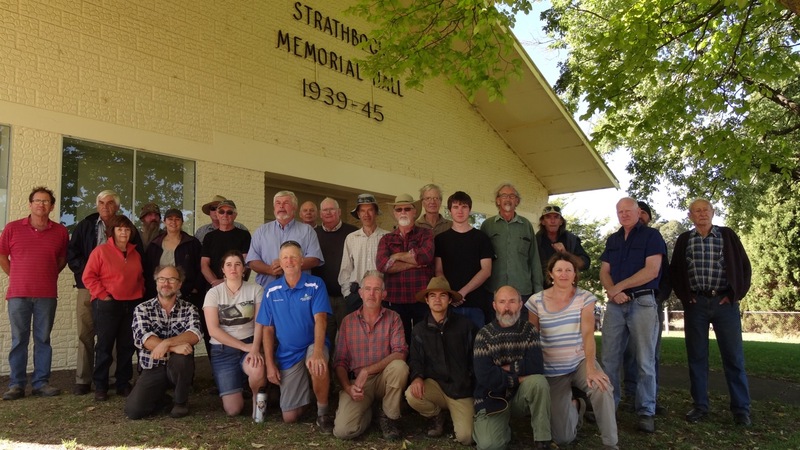 CFA volunteers from local brigades in the Strathbogie Ranges and nearby districts have banded together to form a new group calling themselves ‘Volunteer Firefighters for Forests’ to save the Strathbogie Ranges’ last extensive stands of mature native forests from an unnecessary and destructive burn planned for this autumn. “We are all committed CFA volunteers who have responded to hundreds of call-outs to fires and other emergencies over our years of involvement with the CFA”, said spokesperson Andrew Townsend. “But, we also care about our local natural environment and we do not support DELWP’s plan to burn 30 square kilometres of some of the best quality forest in the ranges. We are all part of this local community and as CFA volunteers we do not see any logic from a human safety perspective in burning these forests right now. This group is very concerned about protecting life, assets and the forest and is convinced that a truly collaborative approach can achieve this. Genuine community consultation is a central platform of the Victorian Government’s ‘Safer Together’ approach to bushfire risk. We fully endorse Minister Lisa Neville’s statement “We will involve local communities in decision making, taking into account what people value in their local area.” And we urge the Minister to be true to her words. 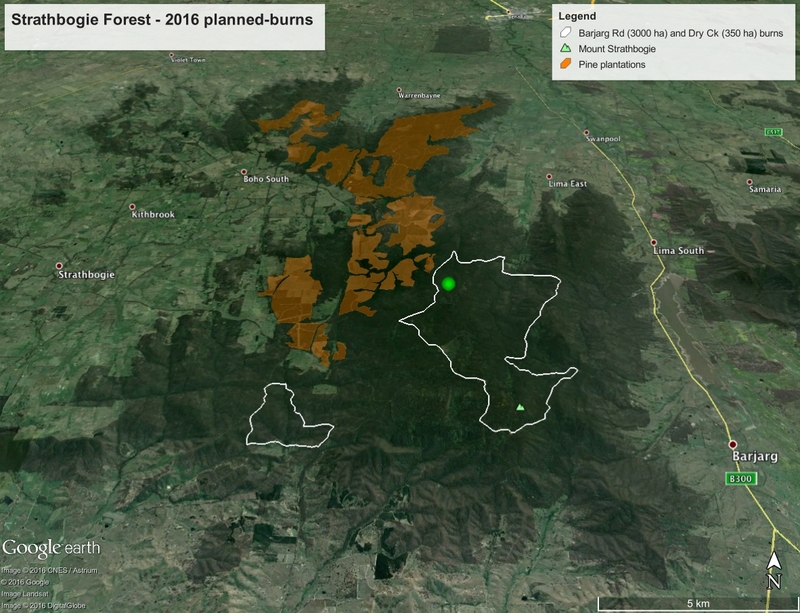 We call on DELWP to defer this season’s burns in the Strathbogie Ranges and commit to genuine community consultation in the future planning of fuel reduction burns. 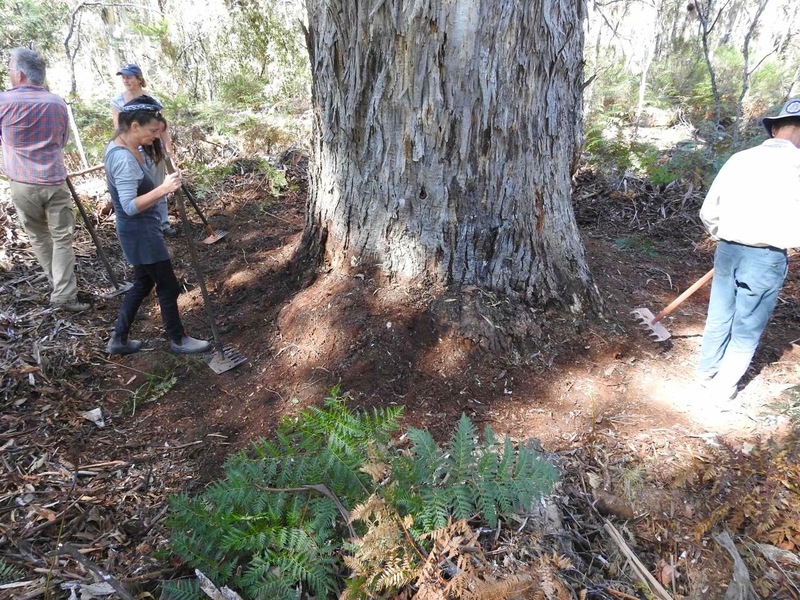 Volunteers rake breaks around old-growth trees vulnerable to fire. 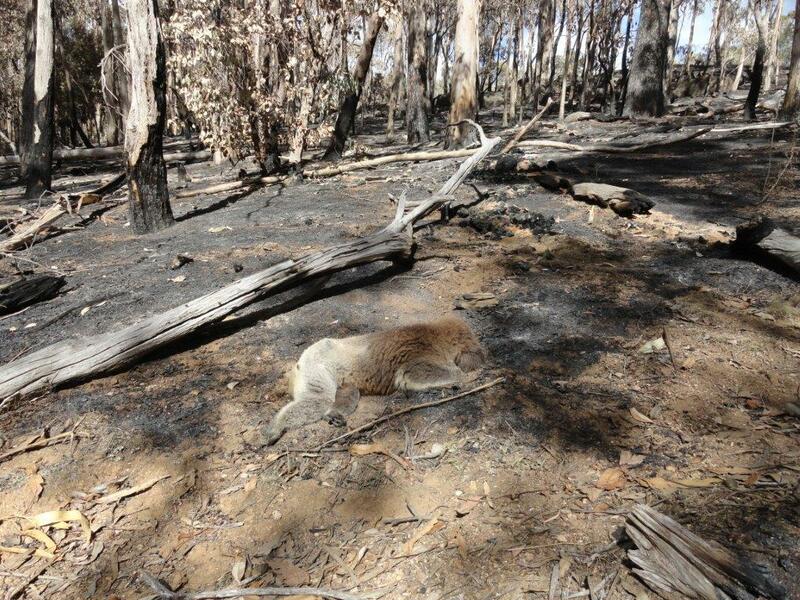 Volunteer Firefighters for Forests acknowledges that the views expressed in this release have not been endorsed by the Country Fire Authority, Victoria. The Greater Glider (Petauroides volans) is Australia’s largest gliding possum and a stunning site at night, high in the tree-tops. The species is regarded as Vulnerable (to extinction) by both the Australian Government (Environment Protection and Biodiversity Conservation Act) and by the Victorian Government (DELWP Advisory List), meaning it’s now on the slippery slope towards extinction if we let continue the current factors impacting on its survival. The biggest of these is habitat loss and the causes of that in the Strathbogie Ranges are logging and planned burns. Greater Gliders den and nest in big hollows, that only occur in big, old trees, like this one, below. These big trees take at least 100 years (possibly more) to develop hollows suitable for Greater Gliders. 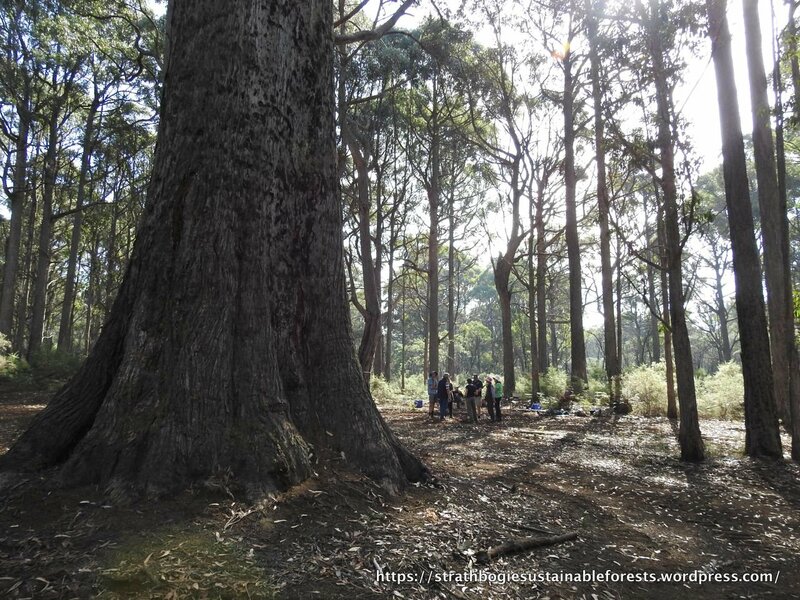 Unfortunately, a single planned burn can kill hundreds of these rare, majestic Strathbogie Forest trees.